Our summer series about transitioning kids from being cargo hauled by parents to pedaling on their own power was born a couple of weeks ago when I wrote about luring parents back to bikes to get more kids riding. I loved all of the comments; they sparked such a rich discussion among parents and non-parents alike about riding with (or as) kids. The discussion also got me thinking about how we’ve handled our personal cycling transition. In three short years we’ve gone from hauling two kids on two Xtracycles (and many times, two kids on one Xtracycle), to one kid on an Xtracycle and one kid on their own bike, to both kids on their own bikes (and lots of combos in between). The change hasn’t happened overnight nor without a little or a lot (depending on the day) of pain. Sara, whose comment made me thankful I live in a bike friendly community, lives in New Haven, CT and rides a bakfiets with her twin soon-to-be-8-year-olds, and an Xtracycle with her preschooler. We had a hard time switching to a self-powered kid mode when we tackled it one at a time; she’s facing this transition with twins! Good question and one that we hope all of you can weigh in on. Sara can’t haul two 8-year-olds around in her bakfiets anymore because the whole combo (kids and bike) is just too bulky and heavy. But the car-centric nature of where she lives means she’s not ready to turn the kids loose directly on their own bikes. She needs something cargo worthy, that won’t kill her and will help delay the inevitable day when the boys will have to deal with speeding cars. Is there anything wrong with parents wanting their cargo bikes to contain the kids and protect them? When kids are cargo, we relish a certain amount of comfort in the cocoon of an Xtracycle Snapdeck, Madsen bucket or a bakfiet or Sorte box. And it’s scary to think of our precious cargo leaving the cocoon and pedaling under their own power. The mean streets have hazards like cars and potholes and train tracks. But we’re rational people, right? We know it’s not really that dangerous to ride a bike. We do it every day and there’s no reason our kids can’t too. How do you know when your kid is ready to ride in the road? I don’t think there’s a magic age or a rigid rule for kids road-riding readiness. It really depends on the kid and their personality. 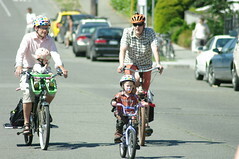 It also depends on the bike friendliness of the community and the parent’s personality. We’ll look at those tomorrow so stay tuned. This entry was posted in bikes, family cycling, kids, kids' bikes, transitions and tagged Family Cycling, kids, kids' bikes, riding with kids, transitions. Bookmark the permalink. Cool site Anne….and a great concept! Thanks, Peter. I’m glad you like it. I totally agree that each child is unique. In addition to personality, there’s the developmental aspect: judging speed and distance, being tall enough to ride a bike with multiple gears, being strong enough to use hand brakes, having enough endurance for the longer rides. I sometimes take for granted that my kids are tall. It makes a huge difference in their physical ability to ride bikes and they are just more visible since they are taller. Hi,everyone I teach bikeability in schools in london,and build my own cycles as well as teach cycle maintenance. children are expected by the government to be able to ride most roads independantly by age 10/11 to match up with changing to secondary school at 11 ,but my own children at 5 and 7 are perfectly capable to ride busy london traffic because they have done it with me for years and have learnt how to observe other road users and stay reasonably safe. The main problem children here face is holding the concentration required on busy city roads and the fact that other road users seem to give less and less consideration to cyclists of any size. it seems to be the more of us cycling the more they assume that we dont need any space and that we have lightning fast reflexes to deal with the fact that they are going to take our road away whenever it suits them. My 7 year old started riding without training wheels just after his third birthday and was competent to ride up front and describe road conditions and make lightly supervised traffic decisions by 5 years old and at 7 i can trust him to make 90% of his cycling safe completely independantly. In contrast my 5 year old is in need of constant reasurance and advice on the road and even occasionaly asks to ride on the back of my surly xtracycle because he isnt sure that he is making good decisions based on traffic conditions and dosen’t feel comfortable with the cars going past so close. so as you say it is purely down to individuals and personal preference. Really looking forward to this, as my 4yo daughter is just learning to ride but I’m already looking forward to a future of more independence. So I’m really interested to hear how other people make the transition. Our immediate neighbourhood is pretty bike-friendly but to get anywhere outside of our little area requires travel on some pretty busy streets. My solution (which, admittedly, required a bit of luck on my part and extra space around the house) was to pick up a used single-speed tandem bike. As my son’s 11 he’s really too big for a trail-a-bike but the tandem works great and he’ll be able to ride it no matter how tall he gets. The other advantage of this is like a teenager riding in a car with a parent, he gets to see how I conduct myself in traffic and learns a bit that way as well. We just got a tandem too (on craigslist)…it greatly increases our range and enables our son to pedal rather than sitting on the snapdeck when we go longer distances. I love it. I’ll weigh in on this one. I was the guy with two kids, the Big Dummy, with the 3 year old on his own on Sunday down in Fremont. Love the blog, keep it up. I’m a fan of trailers for our little ones because of the weather and the option for the kids to have toys to play with. However, once our older one started riding his own bike (sidewalks and parks with incidental road riding) the younger one needed to be involved too. It was no fun keeping the younger girl (1 year old) in the trailer while the boys got to pedal around and she knew it so we went with a front carrier as was my wife’s preference. We tried that out on a beach cruiser with a rear rack because we wanted to be able to use transit in a pinch. Easier said than done! Mounting two bikes at a bus stop while two young children walk around on the sidewalk causes the bus driver to leap into fearful action; not the reaction I was looking for. I needed some way to involve both children in the voyage and be able to carry all needed supplies. Transit would have to wait for when our trips were more simply constructed. Enter the xtra-cycle. It’s heavy, but it works, and with a really expensive kick stand, it works like a car. I don’t know what I’ll do in inclement weather, probably use the trailer in conjunction or in place of the Big Dummy, but it’s fun as is. Onto the point of the post, I like to ride with my son on non-arterials and he’s proven fairly open to correction because he knows so far that riding on the road is a privilege and that he’s a “big boy” for doing so. I hope that I can keep that up. It’s nice to have the option of just throwing the kid’s bike onto my bike as needed and I hope that this option can continue for a couple of years. Nice seeing your family Sunday and keep up the explorations. Hi Brad, nice seeing you on Sunday as well and good to meet you. Chris snapped this photo of you and Tim as we approached the Fremont market. I love this shot! We loved being able to transport the kid bike on the Xtracycle – I think it’s one of the best features. You can let them ride a bit and hook it back up when they get tired. Again, thanks for taking this subject on. There are a few places around where I could possibly work on riding in the streets with the boys riding on their own. However, we must pass through downtown to get to the guys’ school/my work and there just aren’t alternative routes with quieter streets, more bike-friendly neighborhoods to get us where we need to go most days. The Yuba Mundo arrived today and my hope is that this option will do for the twins for the next while. Wonderful photo. You two are fantastic! I didn’t take the photo…Chris Nygaard did…he was snapping photos at the entrance to the Fremont market as we approached….he has a way better camera than us! Organized family group rides are a great way to increase your child’s confidence for riding on public roads. The adults all look out for the young ones, shielding them from traffic and offering friendly advice and encouragement. And it’s simply a great way to enjoy a day with your family. What a great conversation! My guys are 7 and 3.5 and we have one on the way, due in Nov. When I was planning ahead years ago, we opted to get the single seat trailer, as we’d assumed our 7 year old would be big enough for a trailabike when the younger one was ready to ride the trailer. Then the adams’ trailabike recall happened and my husband ruled out ALL trailabikes. So, now, I have the ute (long tail) and bobike, so I can ride with both boys. My 7 year old yearns for independence, though, and has the endurance and stamina for 6+ mile rides. However, his attention span and impulse control leave a lot to be desired on the road. That’s not true of all kids his age, though. Some are more risk-averse/aware and some are more carefree… each child is different. I think it is key to know your child’s capabilities and go from there. That said, I recall being foot loose and fancy free on ~40 mph country roads at the age of 11, on my bike. Where have we landed since that time? I think a pattern of dependence on car for transportation + change in enforcement has led us to a place where “accidents happen” and people are willing to take risks, even by getting in their cars and taking to the road (I’ve been in two nasty car-car collisions just in the past few months). This is why we don’t trust letting our little ones be on the roads. It’s just become an “Acceptable risk” that collisions will happen, and repercussions aren’t severe enough to stop people from engaging in that risky behavior. So, for now, we are sticking to low car traffic to no-car traffic routes. Practicing basic traffic skills, and how to be aware of surroundings. There are some camps and clinics available here (PDX), with experts and law enforcement that help reinforce rules and how to play by them. I think it has to be a whole community effort to integrate the whole packet, but in places like CT there is going to be a LONG way to go. Sometimes, I wish the cost of cars/gas/travel would just skyrocket. That’s the only thing that will make people give true thought to how they are getting from A to B.
Here’s a quote I clipped awhile ago from Copenhagenize, about what a bicycle-friendly country thinks about developmental stages of active transportation. “As a matter of interest, here’s the current guidelines in Denmark for children in the traffic, if the parents have trained the kids in the traffic enough that both parties feel confident. I spent a lot of time training my son, now 7, in cycling to daycare, kindergarten and school. He was confident enough to cycle to daycare from the age of 3 and a half, with training wheels, and from about age 4 without. 3-4 years: Children can learn simple pedestrian rules but they are easily distracted and react impulsively if something catches their attention. Hold the child’s hand and keep the child on the side farthest away from the traffic as possible. 4-5 years: Start bicycle training where there is no traffic. It’s too early to let children walk or cycle alone. They cannot judge a dangerous situation. 5-7 years: Children can keep focus on the traffic for short periods and walk alone on quiet streets. Most can judge an obvious danger and cross streets with a good view of the traffic but intersections are still hard to tackle. Start with bike riding on streets without too much traffic if the child can cycle in a straight line and is good at braking. 6-7 years: Children can walk alone to school on safe routes. According to the law they have to be six years old to cycle alone in the traffic but it is still tricky for them to judge distance and speed so they should be accompanied by an adult when cycling to school. 8-10 years: Most children are now able to judge the traffic situation and can walk alone to school. They can also take a bus or train if the trip is simple. If the route to school is familiar and safe with light, slow traffic, they can cycle to school alone. 10-12 years: At this age most children can handle a more complicated route to school alone on a bicycle and tackle public transport that requires a change of bus or train. Great stuff. Julian. I think I need to laminate that and hand it out to folks who ask why our daughter is riding in the streets. And maybe I could also attach a couple copies to bricks, for those people who let their horns, middle fingers, and expletives express their frustrations about her freedome while they are stuck in a car (I joke, I joke. I wouldn’t ever waste a brick). hello everyone! Great discussion. I don’t have children of my own yet, but grew up with 3 younger brothers, 2 of whom are still under the age of 11, both of whom ride bikes regularly. In the mornings the youngest often rides with mom to school, each on their separate bike, but one on one. She can keep an eye on him easily and also traffic while he gets a feel for riding on the combination of trails and low traffic roads leading to school. I think maybe spending some one on one riding time with kids can definitely give you a better feel for how road ready they really are. Thanks Spencer. And BTW, you’ve got some nice posts on your blog. I need to find some time (!) to get caught up on my bike blog reading. That’s for sure.